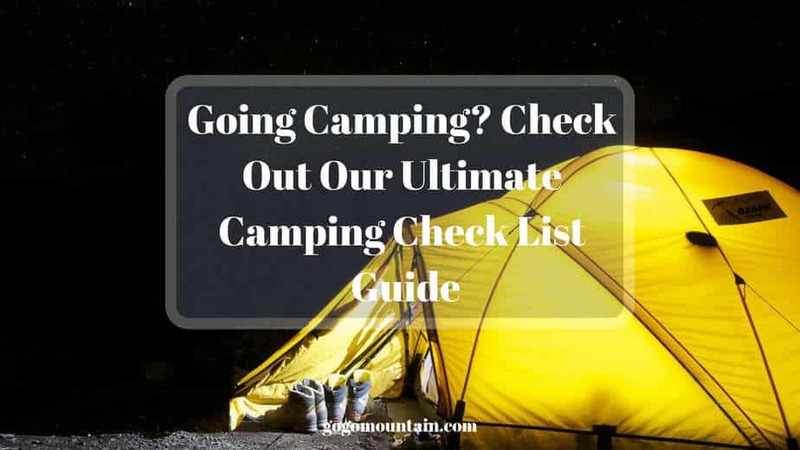 The Ultimate Camping Check List Guide – Camping is a great way to enjoy the outdoors and spend some much-needed time with family, friends, or, most importantly, even just yourself. It’s a fantastic pastime that can keep you active and allow you to explore the wilds of your local parks, a backcountry trail, or even your own backyard. If you’ve never before been camping, you may have created a camping checklist to help you break down what you might need to back. Figuring out what to include on this camping checklist can be a daunting task, especially if you have never been before. Tip 5: Maximize your space. What Should I Do to Prepare Myself for My Camping Trip? Luckily, we have created a simple supplies for camping list so that you don’t need to worry about a single thing when you are headed out the door. Some of the joy of camping is derived from not needing to pack a ton of gear. If you’re doing it right, camping should allow you to get by with packing as little as possible. That being said, when you’re first starting out, you need to bring a bit extra until you get used to being out in the woods. We have broken down a list of what to take camping to help simplify things for you. You don’t need to pack as though you are headed out on a seven-day luxury cruise in order to go camping. 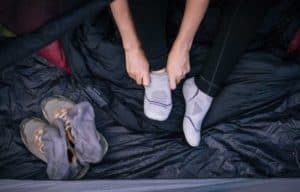 Instead, you should make sure you have the essentials – which consists mostly of a few pairs of dry clothes – in case your other ones aren’t warm enough and you need to layer, or if you get your other pairs wet. A short sleeved shirt and a long sleeved shirt, two pairs of pants, and two pairs of undergarments (including socks). Your clothes should ideally be made out of moisture-wicking synthetic materials or wool instead of cotton. These will dry much faster than non-synthetic materials, and will also be lightweight in your pack. If it’s cold, consider packing an insulated down jacket as well. You should also bring comfortable footwear, ideally a pair that is designed for walking. You might also think about bringing a change of shoes, swimwear, sunglasses, and towels. 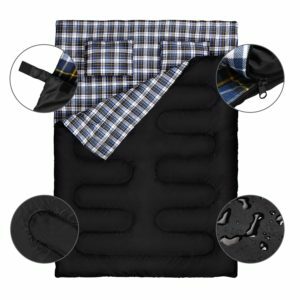 These are not required items, but if you have room in your pack, they will definitely make your trip more comfortable. You should also be sure to pack things like toilet paper and a toothbrush. Think simple when you’re trying to decide what kind of food and drink to bring. While many campgrounds or established sites have drinkable water, others may not. This is obviously also the case if you are headed into the backwoods. Bring your own water or be prepared to treat water if there’s a nearby source. Consider how you plan to camp when you’re created your packing list of food and drinks. If you are camping in an RV, for example, you will have much more flexibility and can bring more food and drinks than you know what to do with. If you’re tent camping, particularly if you’re headed out on a long hike to the campsite, you need to be a bit more strategic. The only major necessities you need are water and enough food to last for however long you are planning on camping, plus a little extra in case of emergencies. Think about bringing non-perishable food items like freeze-dried, dehydrated, or canned foods. Don’t forget about keeping food cool or heating it up – you may want to consider bringing a cooler, ice, a camping grill, camping stove, and utensils along with cookware. Prepare whatever you can at home, and remember that anything you need to cook will likely need to be done on an open flame if you are seeking the most basic kind of a camping experience. If you’re bringing a camp stove or grill, be sure to bring a spatula and fuel as well. 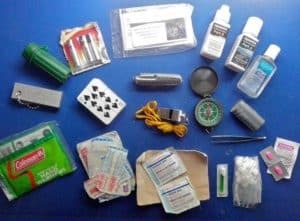 We have included some emergency supplies in our camping list that aren’t necessarily only for emergency situations but should be included and packed in a similar manner. For example, you might consider bringing items like baby wipes, sunscreen, deodorant, and insect repellent. Tweezers and any medication also fall into this category. A good idea is to pack a mini first aid kit in an old prescription bottle or a days-of-the-week medicine holder. This will allow you to hold a couple of each type of medication or toiletry item you might need without having to lug around the heavy bottles. You should also consider bringing a whistle. This is not an absolute necessity, but a good idea in case someone in your party becomes lost. 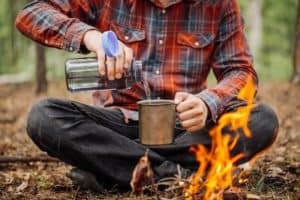 One of the most important tools for you to bring on your camping trip is a lighter, matches, or other kinds of fire starter. If you are planning on cutting your own firewood, bring an ax or hatchet, but remember that if you don’t have strong fire building skills you may want to purchase firewood ahead of time to bring with you. You will also need basic tools like trash bags to keep your trash up off the ground and out of reach of hungry bears and raccoons. You might consider bringing additional tools like a flashlight, lantern, multitool, duct tape, and a mallet or hammer for pounding in tent stakes. If you’re camping at a large campground, you may not need to concern yourself with this category. However, if you’re headed deep into the woods for your camping trip, make sure you pack all of your navigational essentials. This includes items like a backpack, compass, GPS, and a map. You might also want to bring along field guides (so you don’t accidentally confuse that poison ivy you’re using as backup toilet paper as an innocuous leaf, for example) and dry bags to hold all these paper guides in. One of the most crucial items you need to bring on your camping trip is your tent. A waterproof tent is your best bet, as this will protect you from not only inclement weather but also a heavy morning dew. You can put waterproof carpet on your tent floor to help prevent your sleeping bag from getting wet from the ground up, too. You might also want to bring additional tent-staking materials like rope, a tarp, or clothesline. A sleeping bag and sleeping bag are also necessities. Some people prefer to bring along alternative bedding, such as camp cots for two or hammocks, but these aren’t necessary unless you see fit. If you’re trying to cut down on baggage, a sleeping bag for two can eliminate the need to lug around multiple types of bedding as well. 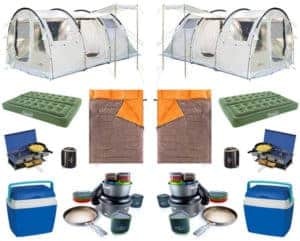 There are some other items you might consider bringing on your camping trip that again, are not necessities, but could make you a bit more comfortable. This list includes things like an alarm clock and batteries, candles or lanterns, camp chairs, firewood, a folding table, or rope. Some other recreational items, like reading materials or campfire games, are also items you should consider if you have space. The whole point of camping is to make do with a little less for the time being. You want to get back to the basics. If you’re only headed out for a night or two, or if you’re staying at an established campground like a KOA, you really don’t need to pack so that your car is loaded to the brim. Instead, take only what you absolutely need, and remember that in most cases, you can always head back out to civilization to grab something you forgot. This goes along with the tip above. Unlike many aspects of your life, your camping trip does not need to be planned to a T. This rule applies to everything from preparing dinner to bringing long extra activities. You don’t need to pack a handheld video game machine, a cell phone charger (for obvious reasons), or the ingredients for a five-course meal. Keep it simple – plan for one-dish meals, instant dishes, or foil dinners that you can make quickly and with limited resources back in the woods. While it doesn’t hurt to pack a lightweight stick of deodorant, you don’t need a wardrobe change every couple of hours or your usual cabinet-load of toiletries. All you need is the basics. Of course, you should make sure that you bring a change or two of clothes in case the other pairs get wet, but you don’t need to think beyond that. Making a list ahead of time will help prevent you from both over- and under-packing. Make your list a week or so before your trip, and then revise it as you move throughout the week. You can always add or eliminate items as you see fit! Making a detailed list will help take some of the stress out of your camping trip. Be sure to check the ten-day weather forecast so you are prepared for any inclement weather, and consider packing well in advance of your trip to reduce stress. When you pack your vehicle, keep in mind the items that will be the last in and first out. Put the things you’ll need first in last so that you don’t have to dig or unload your entire car to get to them. Consider adding a cargo carrier to your car to make transporting all your gear a bit easier. If you plan on hiking into the backcountry for your camping trip, make sure you try on your fully loaded gear ahead of time to make sure it’s not too heavy to carry. Before scheduling your camping trip, think about what you want to get out of the experience. Do you plan on hiking for miles, or do you want to simply lay back and relax in the sun? Are you going to go fishing? 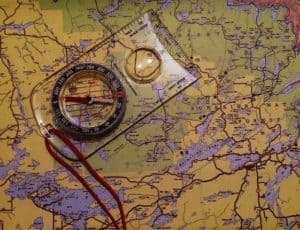 Figuring out your exact plans, and then deciding how you will carry out those plans, is crucial when you are getting ready for your camping trip. This isn’t just to help you pack; you may also need to purchase additional equipment or take classes in certain skills so that you are fully prepared for the experience. Make sure you have all of the equipment you need for all of your camping activities. Collect or purchase necessary items and cross them off your list as you add them. You should also take the time to check all of your gear and evaluate its worthiness for the trip. If your tent is filled with holes or your hiking boots are worn through to the sole, consider purchasing replacement items. Familiarize yourself with the local area, as well as any regulations that might be in effect. For example, some campsites will only allow certain kinds of camping activities. Some may not allow fires or similar activities, and you need to be prepared with this information so that there are no surprises. Don’t let the first time you set up a tent be when you arrive at your campsite. This is a bad idea for several reasons. If it’s a brand new tent, you may need to purchase additional equipment (like poles) and you won’t be aware until you have already arrived at the campsite. Knowing the intricacies of setting up your tent and using your other equipment will also help alleviate some of the anxiety surrounding your camping trip, as you won’t be going into the experience without any skills. Speaking of skills, the period before your camping trip is also a great time to start learning and practicing some basic skills. For a camping trip to be successful, you need to know things like how to start a fire or tie a knot. Learn these skills ahead of time instead of experimenting with them on the fly. Once you’re packed and ready to go, don’t waste any more time. A camping trip is a great way to unwind, and if you’re armed with the essential equipment and knowledge, you’re sure to have a memorable, enjoyable time. So, happy camping guys, its the most fantastic way to build relationships, strengthen family ties and arguably the most important thing of all, destressing after a hard week at the office or wherever you work.